Nova Scotia may be our home base, but it never stops surprising us. Almost completely surrounded by ocean, this eastern Canadian province will inspire thanks to its varied natural beauty and you'll enjoy the sea air as you bicycle along some of the country’s most famous shorelines. Our cycling tours in Nova Scotia include three guided routes that explore the famous Cabot Trail, the South Shore and an itinerary that takes cyclists along the coasts of both the Atlantic Ocean and Bay of Fundy. 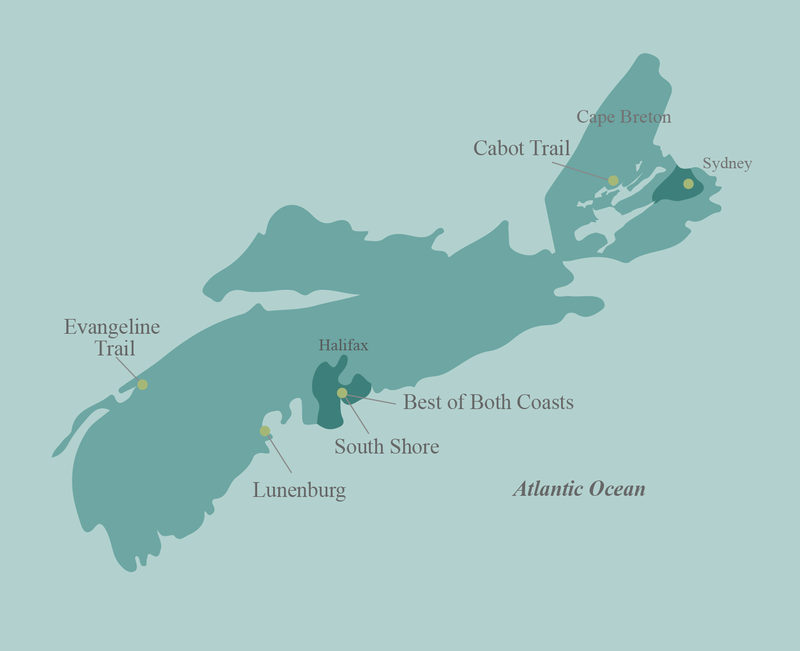 We also arrange self-guided tours for the independent cyclist, providing itineraries that will take travellers along the Cabot Trail, South Shore, Evangeline Trail and around Lunenburg, one of the province’s most historic and picturesque towns. Daily bicycle rides range in distance from 13 to 130 kilometres, and destinations on each journey include small fishing villages, wildlife-filled highlands, beautiful beaches and UNESCO World Heritage sites. You won’t have any trouble working up an appetite, which is a good thing, as we’ve designed stops on our routes to take advantage of the region’s gourmet specialities — namely, seafood, though Nova Scotia is a sweet spot for bakers and, with stops at some of the best bakeries in the province, we do our part to help you carbo-load before hopping back on your bicycle. Each Pedal and Sea cycling tour, which ranges in duration from five to seven days, comes with van support, snacks and refreshments and admissions to parks (when applicable). And along with cycling, to truly experience everything this beautiful province has to offer, you’ll also have the opportunity for kayaking, hiking, whale watching — even a round of golf. We’re excited to welcome you to Nova Scotia — our backyard — and we’re sure that one trip will only leave you wanting more. 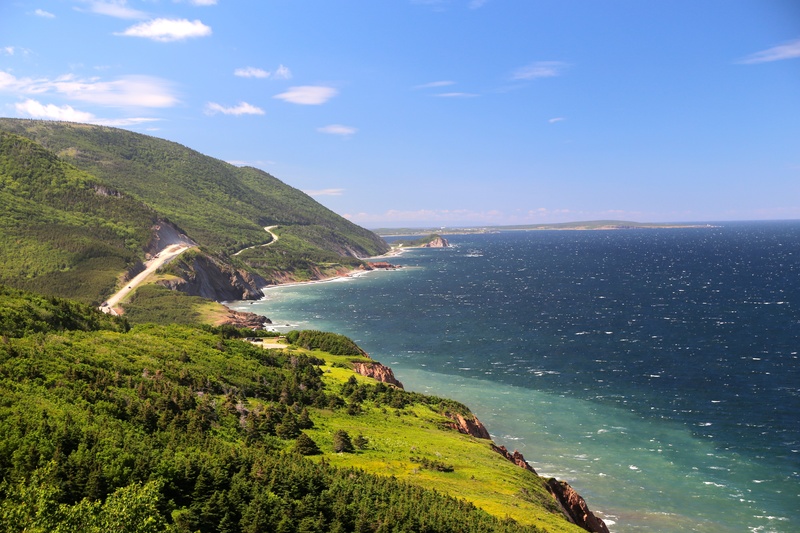 One of Canada’s most famous routes, you’ll love cycling Cape Breton and experiencing its beautiful valleys, stunning Highlands National Park and charming towns and villages. 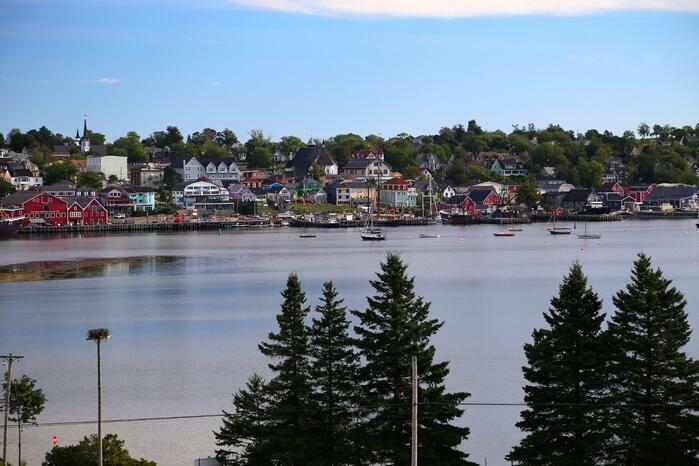 Our tour starts and finishes in the picturesque town of Baddeck. From there, we cycle clockwise on the Cabot Trail, visiting the angler’s paradise of Margaree Valley, the French community of Chéticamp, where there’s the chance to go whale watching, and the gorgeous Cape Breton Highlands National Park, where we’ll keep company with wildlife. The rides on this tour range from easy to challenging, and it is most suitable for cyclists of moderate fitness levels and higher. Van support is provided for any riders who would like a break. Read more about this six-day itinerary here including 2019 scheduled departures and prices. This is also available as a self-guided tour. Experience Nova Scotia from its north and south coasts, getting to know its towns and terrain along the Bay of Fundy and Atlantic Ocean. 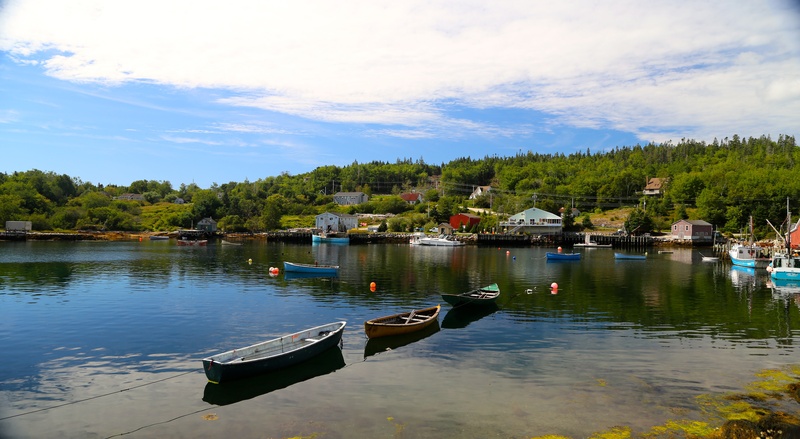 You'll start the week cycling along the South Shore, exploring the Aspotogan Peninsula, home to idyllic small towns, before making your way to the colourful Lunenburg, a UNESCO World Heritage site. Our cycling route continues south through LaHave and Liverpool before we cross over to the Annapolis Valley, where you'll ride east towards Wolfville, and experience charming towns, roadside stands filled with farm-fresh produce and the stunning Bay of Fundy — home to the highest tides in the world. Cycling on this tour ranges from easy to challenging, and van support is always nearby for those who want to make use of it. Read more about this seven-day itinerary here including 2019 scheduled departures and prices. 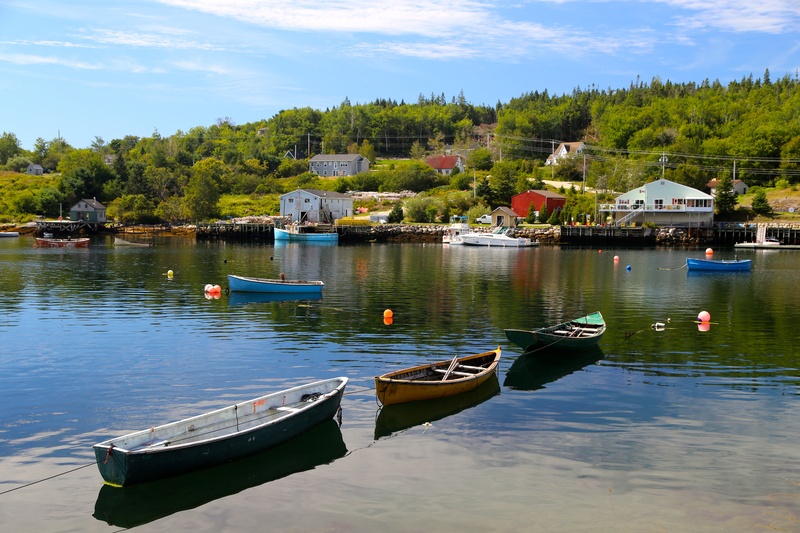 The tour hugs the coastline of the Atlantic Ocean and is ideal for those who want to get up close and personal with some of Nova Scotia’s cozy fishing villages and the province’s history. Though the journey starts and ends in Halifax, the cycling begins in the small but active community of Hubbards. From here, you'll ride around the Aspotogan Peninsula en route to Lunenburg. Its old town is a designated UNESCO World Heritage site; established in 1753, it is the best surviving example of a British settlement in North America. Along the way there will be seaside picnics, secluded beaches and even sea kayaking. Cycling during this trip is easy to moderate and suitable for all fitness levels. Van support is always nearby for those who would like it. Read more about this six-day itinerary here including 2019 scheduled departures and prices. This five-day tour of Lunenburg and its neighbouring towns will enchant independent cyclists who want to experience Nova Scotia’s culture and nature. A shuttle will meet groups in Halifax and transport you to Lunenburg. Cycling routes will lead you around Mahone Bay, home to a thriving artist community, and LaHave, where wildlife spotting should be on the agenda. 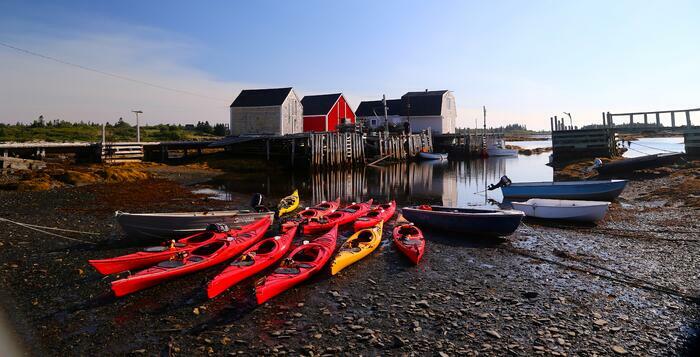 While in Mahone Bay, there’s also the opportunity to explore the area’s 350 islands by kayak. Before returning back to Halifax, our shuttle will make a stop at the Peggy’s Cove — you’ll definitely want to keep your camera nearby to capture this stunning landmark. This tour is suitable for all fitness levels, as rides range from easy to moderate. Read more about this itinerary here including 2019 scheduled departures and prices.